Some of you may have seen the ads – seven figure earners teaching how to make money online through one of the most comprehensive affiliate marketing training out there. But, what is Powerhouse Affiliate all about? Is it legit and do they live up to the hype? This review will show every bit of the details that you need to know before signing up. This all-inclusive training platform is created in August 2014 by an experienced CPA marketer called Joey Babineau. It comes with several training modules, web hosting service, an affiliate network as well as a forum area that is fully accessible for paid members. Based on their current Facebook group status, the site has about 10K members, coming from all over the world. The training is pretty much self-paced and contains most of the resources (some owned by Joey and some are programs that he’s affiliated with) that you’ll be needing to start an affiliate business. What’s Covered In The Training Courses? The entire training is segmented into different sections based on learning levels and specific marketing strategies. There are 7 core courses followed by 10 additional tutorials on the side. Affiliate Marketing Certification 1.0 – Contains 10 modules that cover the foundation of affiliate marketing from niche selection, website building and traffic generation. Powerhouse Affiliate Marketing Bootcamp 2.0 – Contains 10 modules that teach you how to set up your first marketing campaign through landing pages using several online tools. Affiliate Business Builder – Contains 7 modules that teach you how to create a funnel from scratch for your first email marketing campaign. CPA Display Academy – Contains 10 modules that teach you how to do marketing with native advertising. CPA Cash Vault 3.0 – contains 8 modules on how to get started with CPA networks. Website Traffic Certification – contains 8 modules on how to generate paid traffic through popular advertising channels. Five Phase Email List Building – contains 6 modules and samples on how to set up an email marketing campaign. In-Text Advertising and Sample Campaign – learn how to acquire and test for this type of traffic. CPA Mobile Mayhem – consist of 4 modules to help you understand about mobile traffic and how to acquire them. As a member, you’d also be able to access previous webinar recordings on a variety of marketing topics, case studies and their private Facebook group. With that many numbers of courses and lessons, there no doubt that the platform is packed with a lot of training materials. So, how much do you need to pay to benefit from all these? 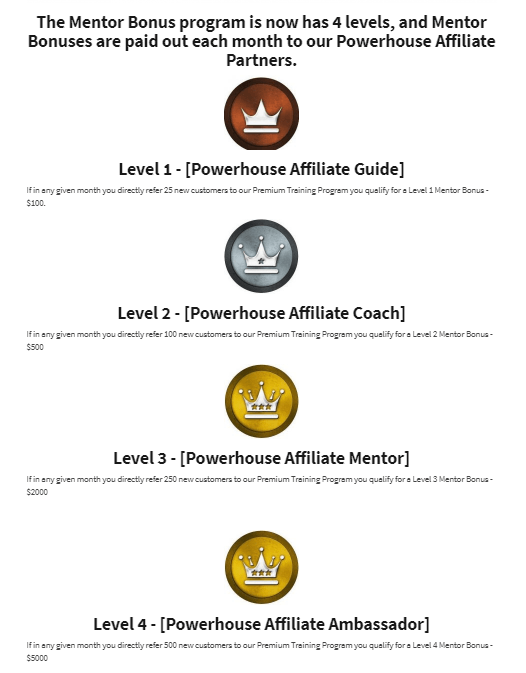 Well, Powerhouse Affiliate basically offers two types of membership here – the free starter and the paid premium. Starter members can only access the Affiliate Marketing Certification which is the course, while Premium members get to access all the courses plus other features for the price of $47 per month. At the moment, they don’t seem to have an annual membership plan. Seeing that most of the training emphasizes on targeted traffic generation, it’s important to note that investing in other tools is inevitable to achieve results. Besides that, you’ll be paying for ads so there will certainly be additional costs to run the online business besides paying for the monthly membership fee. How Can You Benefit From The Training? I was actually quite impressed with the amount of stuff that’s covered in the courses, considering the fact that Joey single handedly crafted everything himself. I presumed so because it doesn’t seem like there’s anyone else conducting the training. 1 – A quick check on the owner’s profile shows that he’s Canadian and a family man. So that’s pretty legit and for me, he doesn’t come off as one of those marketing gurus who flashes cash and expensive cars just to entice you into his program. You can tell from the beginning that it’s an education platform more than anything else. 2 – Their hosting service, Afflauncher, is connected to an easy-to-install WordPress system which is also what I would recommend for building a good website. In fact, when you signed up as a premium, you have the privilege to host up to 25 custom websites, get free SSL certificates and unlimited traffic, all for free. This is equivalent to 25 potential online businesses/landing pages in any type of niche that you desire. You may also purchase domain names through the hosting for $15 per name (an additional $4.95 for WhoIs Protection) for a year. 3 – The lesson on niche selection is very thorough in showing different techniques to uncover what type of business is profitable to start within the online space, especially when it comes to digital products/services. So if you are new to this idea and wondering niche to choose, the course is worth following through. 4 – In order to optimize a web page for SEO, Joey recommends Jaaxy, which is a familiar tool that I’ve been using personally for years to discover low-competition keywords for my site. Unlike other tools that come with all the complicated metrics, this one is more simplified and easy to interpret, especially for beginners who are new to keyword research. Among other features that you can benefit from Jaaxy are keyword brainstorming, page rank tracking, competition analysis and affiliate programs finder. If you like to have a peek inside, use the plugin below to run a few searches (up to 30 free searches) and experience it yourself. 5 – For intermediate level marketers who are looking to scale conversions using landing pages, there’s a fair bit of good tutorials showing these techniques by leveraging specific WordPress plugins or utilizing professional softwares. While it’s not necessary to purchase these tools immediately, it’s worth learning how they can be integrated into your website to improve on sales. 6 – Most CPA commissions range between $0.50 cents to $20 per action so comparatively, it pays better than sales-based offers. But starting with CPA marketing can be challenging due to the fact that it’s not easy to get accepted into certain networks, you need to research to find good products and getting targeted traffic to these offers can cost a lot of time and money. To avoid certain pitfalls and improve your success rate with this type of marketing, Joey has outlined step-by-step tutorials on how to thread the process carefully. So if you are really interested in CPA, you should certainly go through his courses first. 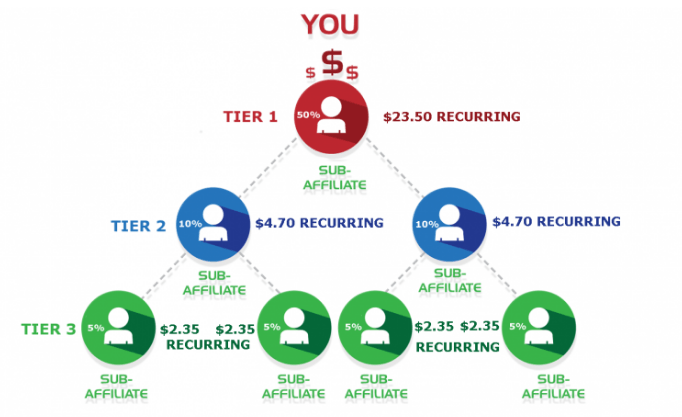 7 – As a premium member, you would automatically be made into an affiliate of Powerhouse. The commission offers come in 3 tiers, whereby you would earn 50% from your direct referral, % and % from their subsequent referrals. Besides that, you can also accumulate mentor bonus up to 4 levels, cashing in between $100 to $5000 per month. The volume of earnings will depend on the number of new members you referred to the platform. Affiliates are provided with email swipes and attractive banners to capture the audience’s attention. So if you found the training to be helpful and want to promote it to other people, then the Powerhouse affiliate program can be an option for earning an additional income. Despite the thoroughness of the program, Powerhouse Affiliate is far from being perfect. As I dug deeper, some aspects of the training seem to be lacking, making the platform to be less effective than intended. 1 – Firstly, the teaching materials consist of 80% text content and 20% videos. In fact, the videos can be found on their YouTube channel so they can actually be accessed for free without the membership. Now I don’t know about you, but reading long tutorials can be somewhat boring and often times, disengaging. The biggest setbacks is that there’s no action based learning going on. Basically, you are just moving from one module to another without doing any application work. So, it’s harder to tell if you truly understood what is being taught. This will leave you hanging on what to do next after completing all the courses. 2 – Being highly focused on paid traffic generation has one obvious downside. You don’t get to learn a lot about free traffic acquired through SEO techniques. That means, there’s little emphasis on content creation and even if there is, it’s all about outsourcing, which will incur more costs to your business. In case you aren’t aware, organic searches can be a tremendous source of traffic to one’s site – sometimes, as much as 80%. Without SEO, you are going to be spending a lot on paid traffic, like really a lot. 3 – In addition, some of the training content is either very minimal, outdated or missing altogether. It doesn’t look like the owner has made any effort to update on the training materials so far. As for the webinars, there are only 4 recordings so far and the last one was done in November 2018. Will there be more in the future? We don’t really know. 4 – At this point of writing, the CPA network that was recommended appeared to have shut down. So all references and links pointing towards this platform are either not working or not relevant anymore. This can be confusing when you are all set to dive into CPA marketing. 5 – Next, the forum area is a fairly quiet place. It doesn’t seem like there is a lot of discussion going on, many questions asked by the members are often left unanswered and there isn’t a lot of new comer either. However, more than what’s lacking is the fact that there are a few suggestions within the course I strongly recommend that you stay away from, for the sake of your own online business. 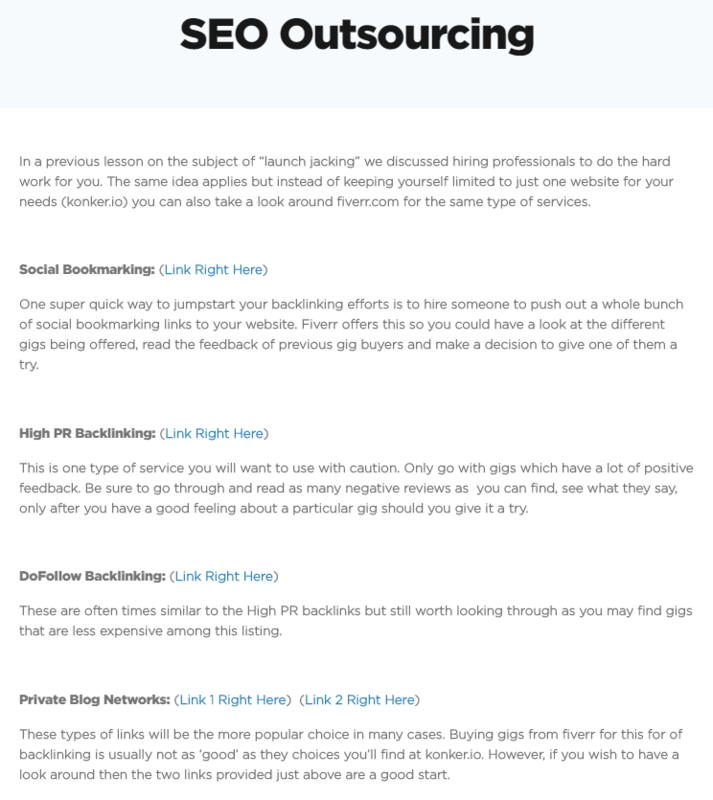 1 – Using Private Blog Network (PBN) for link building – PBN is basically a network of websites used to build links and pass authority for the purpose of manipulating search engine rankings. Nowadays, this is considered a bad tactic and no longer serves any long term values for websites. If you still insist on using it, be prepared to be penalized by Google. 2 – Using Private Label Rights (PLR) sites for creating content – PLR is basically any type of digital content (eBooks, articles and etc.) that gives you the right to edit however you want. People generally buy them so that they can spend less time creating their own content. However, the downside is that the content quality may be poor or worse, contains incorrect information. So instead of using as it is, you actually need to edit and do some add ons. Plus, if other people are using the same thing, you’ll run the risk of publishing duplicate content on your site. Overall, it may actually take more effort to make the changes than producing a new content yourself. Is it truly a time saving strategy? I’ll let you decide for yourself. 3 – Using Fiverr for SEO work – Fiverr is well known for providing all sorts of gigs for online businesses, from creating a brandable logo to freelance article writing. But when it comes to optimizing a website ranking on the search results, I would think twice before using their services. Some gigs can help you tweak certain SEO settings and some claim that they can generate good traffic to your website. Often times, it means they would go and purchase backlinks, buy search traffic on your behalf and bombard your blog pages with comments. On the surface, these actions can bring you spikes of traffic, but they can also increase the bounce rate and doesn’t produce any long term effect. The fact that traffic is manipulated in the first place goes against the process of while hat SEO which is supposed to be naturally occurring. So paying for a five dollar gig (or more) totally defeats the purpose because there’s minimal to no positive impact on your rankings at all. 4 – Using Solo Ads for building your own list – Solo ads are basically email-based advertisements you buy from other web owners. You purchase their lists and send out your offers (ads) through your email. And that’s where the problem begins. You don’t know how the customers emails are acquired in the first place and you don’t know how well these clicks will convert to your offer. In best case scenarios, there will be a lot of good performing clicks. In worst case scenarios, your email is going to look like a spam and no one would even be bothered to look at your offer. The thing is, what works for one marketer’s list may not necessarily work for yours. 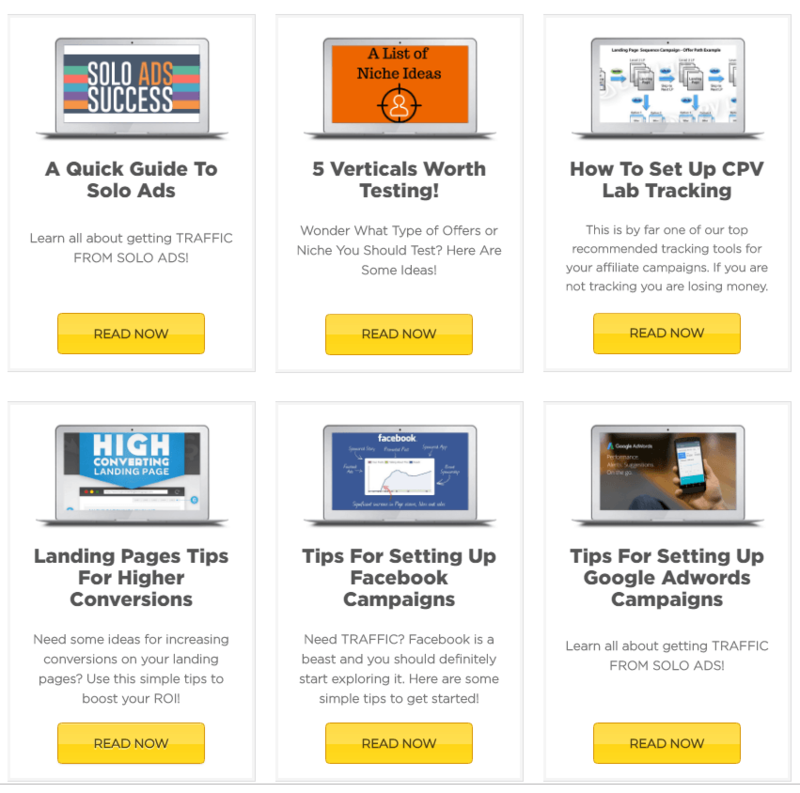 Unless you spend a lot of money testing it out, there’s no way of knowing if solo ads will work for your business niche. Is Powerhouse Affiliate Training Worth Joining? The overall training quality is okay while you absorb all the details from basic to advanced marketing techniques. For those who are interested in promoting high ticket digital products that involves CPA marketing, the course might be worth checking out. Just be prepared to invest on certain tools like a good autoresponder, landing page and tracking software. But without good engagement, updated content and some not-so-favorable guidance, you are merely paying for the WordPress hosting in the long run. If you are making good use of all 25 websites allocation, then that’s fine, but to maintain a site for $47 per month, is a bit costly in my opinion. The training is more suited for marketers who are ready to take their business to the next level. For beginners, I find it overwhelming as it doesn’t cover the basic of traffic generation and requires a certain budget for testing out campaigns. If you belong to the latter group of people, the Wealthy Affiliate training platform may be a better choice. It’s not only comprehensive, but they also have a lot of robust features that can benefit you. Well, I hope you’ve become more informed through this review and now know which training to go with moving forward in your journey as an affiliate marketer. If you’ve any questions or comments, feel free to leave them in the space below. I am surprised that a training platform encourages its members to use sites such a Private Label Rights to avoid writing your own content and Private Blog Network to manipulate search engine results. I much prefer to write my own content and have seen better results, paired with good SEO versus using those outdated tactics. Interesting review. I have always wondered what’s inside Powerhouse Affiliate since I saw their ads on Facebook. Judging from their certificate course, the bootcamp course and the details in those courses, it seems like a pretty legit program, minus some deficiencies. It would be better if they had more images and videos to support the training content. I’ll go check out their YouTube video and see what it is all about. Although it seems like a genuine platform, I would think twice before joining Powerhouse affiliate because it doesn’t seem to teach the most vital thing about online business which is content writing. You will constantly be using a lot of money to test different techniques and channels and those are very costly experience for beginners, in my opinion. While I was going through the review, the primary thought that struck my mind is, ‘this program looks like the Wealthy Affiliate program” but with some difference. Obviously as a beginner, it’s wouldn’t be that good in light because you will have to take out some initial investment to purchase advertisement of which you are in all likelihood going to loose some cash at first, in the experimentation stage. This may not be the correct program for me because I know I am not a risk taker with regards to money. This is a thoroughly analysed review. If the videos are available on YouTube channel, why should I care about paying $47? What’s more confusing for newbies is that the tutorials aren’t as structured as they are supposed to. Even though it’s not a scam, it doesn’t seems to offer a great deal of benefits either. I could just watch their videos on YouTube for free. I couldn’t agree more about the downsides of buying traffic. Sure, it’s fun to see your traffic spike, but it’s certainly not going to generate any sales, which is really the whole point. And if it artificially boosts your Google ranking, – well – what goes up, must come down, right? And once that bounce rate starts going stratospheric, that’s exactly what will happen. Good, thorough and fair review, I think. I must say that this article is pretty interesting and helpful Cathy. At first, I thought they were some kind of scam but it sounds quite legit. CPA is one topic that curious me too and I would like to learn more about it. 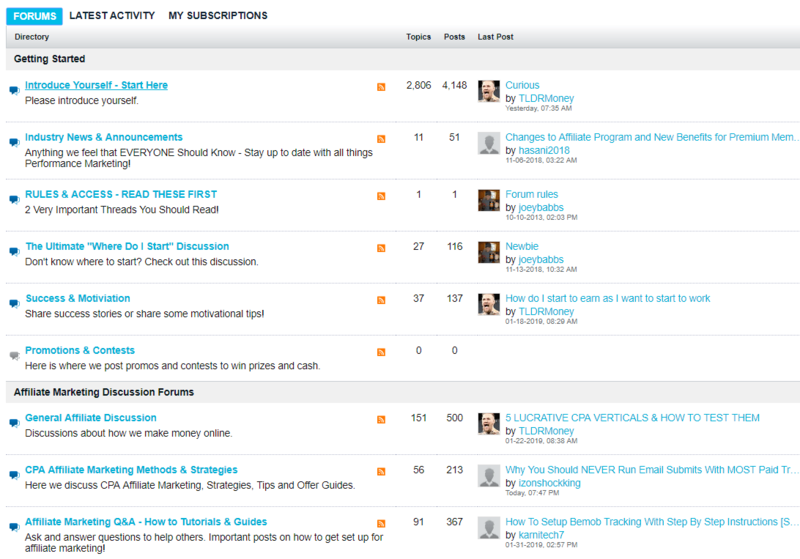 I might give this Powerhouse Affiliate training a try. Hi Cathy. I believe I belong to the “latter group of people” – the beginners. The techniques seems too much for me at the moment while I am still learning the ropes of online marketing, but once I’ve become more experienced, I will consider taking my idea to the next level with Powerhouse Affiliate’s training.